Again, I'm pretty sure I'm behind the times when it comes to Because of Winn-Dixie . But not my much, in the grand scheme of things. First published in 2000, this is Kate DiCamillo's (of the recent Tale of Despereaux fame) first novel. Made into a movie in 2005 (that I haven't seen either) this is the story of ten year old Opal who moves with her preacher father to a small town in Florida. Her mother having left them when Opal was only three years old, there is a certain sadness about the book, as she knows a big part of who she is, is missing. It is not until Opal claims a stray dog (which she names Winn Dixie) that things start looking up for her. This is a dog that loves everyone and that everyone loves in return. Soon, the lonely Opal has a regular handful of town folk that she accepts as her friends and who she begins to feel as if she belongs to. In short, the dog is something of a healing balm for both Opal, various town folk, and her father who has mourned the loss of his wife for some time. This story is sad, but hopeful. I wasn't sure what to make of it at times and I think I'm probably still sitting on the fence about it just a wee bit. I thought DiCamillo handled the situation of Opal's mother vary tastefully - not necessarily condemning her actions, having Opal admit the pain and loss that she felt, while still being able to grapple with life and live responsibly. Sure there is a sadness but it is dealt with as maturely as any 10 year old could possibly be expected to deal with it. She misses her mother, she'd like her to come home, but she develops a relationship with her father over the course of the book that stabilizes her young life. I think on the whole I kinda like this book and can see how it would make for a good movie. It's a generally heartwarming tale about a girl and her dog that concludes as best as it can, given the circumstances, without leaving you feel depressed and anxious. I'm sure the dog was cute too. In a world of books where mothers and fathers are frequently absent, this one is well-done, giving a picture of harmony and trust between the remaining parent and the child and for that I say "Thank you!" to Ms. DiCamillo! For other books about dogs, visit the Children's Classics carnival today over at 5 Minutes for Books where were talking about classic dog characters! I had a hard time finding a Dog book this month, too! 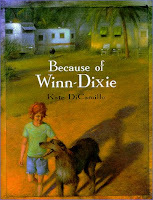 I never even thought of Winn Dixie; I've never read it either! I liked the movie a lot. I haven't read the book, but we have it. Is this one you would consider appropriate for M? We found it on audio at the library for me...but was considering sharing it too.